We just might have a resident Hawaiian hawksbill. Last week, on July 26th during our PM dive, we saw Keoki again in about the same place as our first sighting. There was a reverse current, just like the last time Keoki breezed through here, something we think hints that she is from the south. We followed her long enough to get a right profile so that our identification logs will be complete. 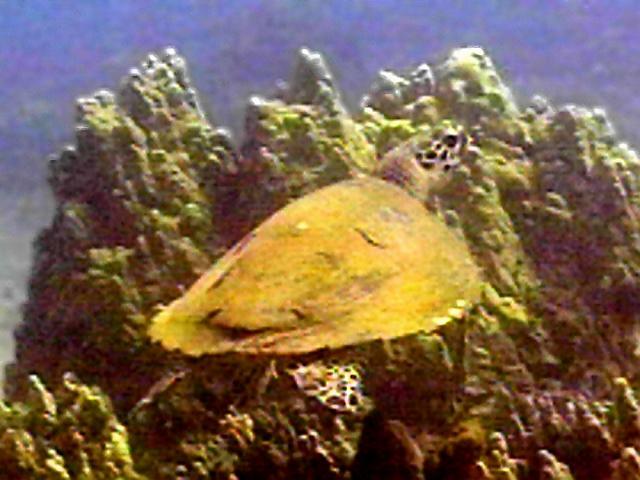 We just might have a resident Hawaiian hawksbill. The area where we sighted Keoki both times is where we descend to start our dive, and we also pass there on our way back to shore. Now we don't go by without checking our cameras to make sure they are primed should Keoki make a third appearance. We have started calling this area Keoki's Korner. On July 26th during our morning dive, we saw something cool and fun--a nice change from the spectre of fibropapilloma. We were about to head back to shore when we looked back and saw a purple lump on the carapace of a resting turtle. There, confident as could be, was a good-sized octopus having a look-around. The turtle looked a bit embarrassed but said nothing. It was magic. All around swirled the school of goatfish, and the octopus looked for all the world like a Bahamian cop directing traffic. There, confident as could be, was a good-sized octopus having a look-around. We captured the moment on video but we knew there was no point attempting a photograph. We were packing the wide-angle and it would require us getting close to the eight-legged wonder. Now, octopus are more than happy to stick out their heads and look about for an entire dive. They are really curious. If they think they've attracted your attention, however, they start, change colour and blotch up. If you approach them, they balloon away, all eight tentacles waving aloha. That is indeed what happened. On our July 30th late afternoon dive, we sighted one of the most heart-wrenching sights we've ever seen. Each summer, fibropapilloma spits out new victims. 1998 is no exception. 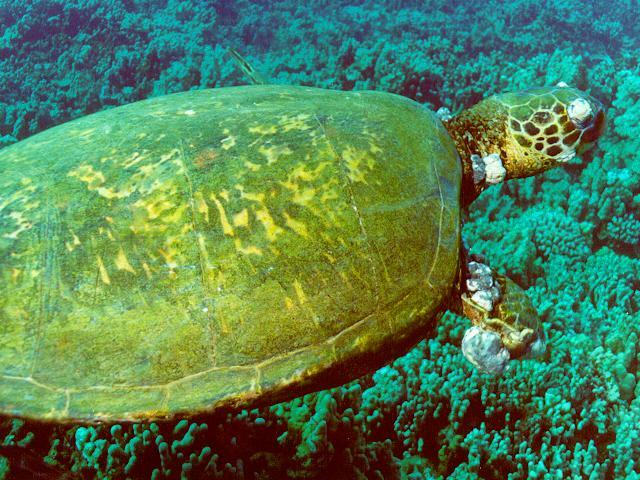 We sighted a large turtle resting in a coral depression, both eyes covered with tumors. Its necks and shoulders were also burdened by large angry-looking growths. Its right front flipper was gone, with all but 6 inches of stump and flapping flesh remaining. Then the turtle lifted. It was ghastly. Its right front flipper was gone, with all but 6 inches of stump and flapping flesh remaining. What was left of its limb was crowned with several large tumors. This stump worked in unison with the front left flipper but the turtle laboured moving its bulk through the water. We don't know whether this is the Watermelon Turtle from last season. (We had sighted a large honu with a massive watermelon sized tumor growing under her right front flipper from "elbow" almost to the tip. We'd also heard about a large turtle at the Hyatt Reef who spent most of her day rubbing a tumor on her front flipper against a rock. We were told part of the flipper was hanging on by a mere thread and it would soon lose its limb. Either way, this sight won't flush from our heads any time soon. On the morning dive of July 28th, we had another reverse current. This often brings in new turtles, particularly from the south. This time, we saw a rather tame, confident juvenile honu sporting tags. 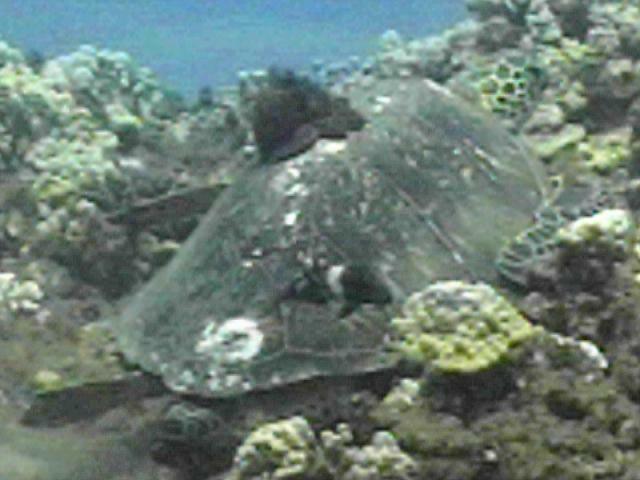 This is unusual because most tagged turtles are mature females who've nested at the French Frigate Shoals. Peter managed to read the tag on the turtle's left rear flipper: K 17. Last summer we'd sighted a turtle with tags K19 and K20. We'd advised George Balazs of this tag number and he said this was a turtle he had captured, examined, and tagged at Black Rock in 1993. We assume that K 17 is a honu tagged by George during that same tagging excursion. It also makes sense that the turtle comes from Black Rock. 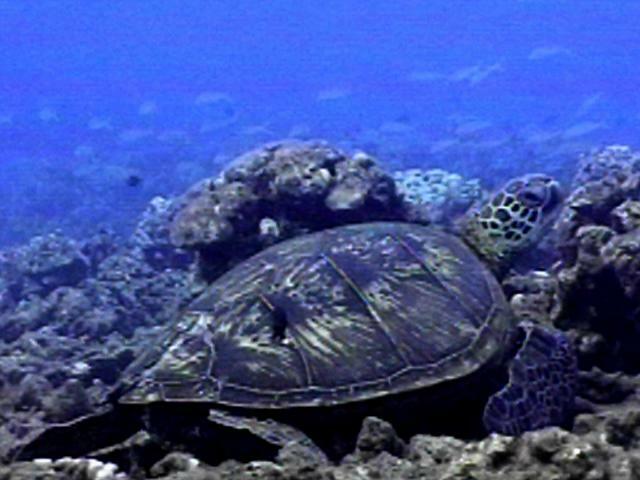 Black Rock is to the south and the honu was likely encouraged to show here because of the south to north current. Either way, we have advised George of this sighting and will share any information we receive from the National Marine Fisheries Service in Honolulu. K 17 has a nasty gash splitting the rear portion of her carapace. One unfortunate note: K 17 has a nasty gash splitting the rear portion of her carapace. We suspect this is propeller damage, likely suffered after 1993. we're sure George can shed some light on this also.